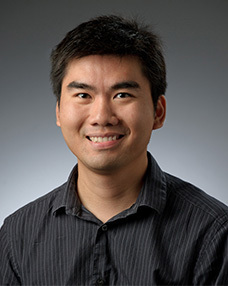 Tengfei Luo, the Dorini Family Collegiate Chair in Energy Studies and assistant professor in the Department of Aerospace and Mechanical Engineering at the University of Notre Dame, has been named to the 2016 Class of DuPont Young Professors, one of only eight young faculty to receive the honor this year. The DuPont Young Professors grant program supports young researchers engaged in highly original research across a variety of fields, including nanotechnology, carbon dioxide capture, genomics, DNA sequencing, system biology and the synthesis of natural products, herbicides and enzymes. Since 1968, the program has recognized and provided over $50 million in funding to more than 700 young professors across 150 institutions in 19 countries. This year’s class will share more than $350,000 over the next two years to support research addressing global challenges in food, energy, and protection. Luo leads the Molecular-level Energy and Mass Transport Laboratory at Notre Dame, where he focuses on understanding the fundamentals of nanoscale heat and mass transfer using computational and experimental techniques and applying that knowledge on the molecular level to engineer novel materials for applications such as heat transfer, renewable energy, water treatment, and cancer therapies. The research he will be pursuing during the three-year award period — including presentation to the DuPont research community — will study how molecular structures can impact the development of bulk polymers and influence their thermal conductivity for use as novel materials in new and existing applications. In addition to the DuPont Young Professor Award, Luo received the 2015 DARPA Young Faculty Award and was also an Air Force Summer Faculty Fellow in 2015. He is affiliated with the Center for Sustainable Energy at Notre Dame and the University’s Center for Nano Science and Technology and has developed a number of national and international partnerships, as illustrated by receipt of the inaugural Global Collaboration Initiative Grant at Notre Dame [to develop novel water treatment technology with the SP Research Institute in Sweden] and the Luksic Collaboration Grant, which partners Notre Dame and the Pontifical Catholic University of Chile [joint efforts focused on thermoelectrics]. A member of American Society of Mechanical Engineers, American Chemical Society and American Association for the Advancement of Science, Luo is the author/co-author of more than 50 journal papers and one book, the Handbook of Molecular Dynamics Potential Functions. He is a 2005 graduate of Xi’an Jiaotong University, China, and received his doctorate in mechanical engineering from Michigan State University in 2009. After completing a postdoctoral fellowship at the Massachusetts Institute of Technology, Luo joined the University in 2012. Managed by DuPont’s Science and Innovation organization, the program helps promising young and untenured research faculty begin their research careers. In addition, it supports DuPont’s strategic goal of broadening and extending DuPont’s business horizons through the advancement of emerging science that originate from inside the company as well as our research partners. The program dates to 1918, when Pierre S. du Pont selected 42 universities in the United States and provided grants that supported young faculty. In addition to providing unrestricted funding to new faculty, the program enables DuPont to build a foundation for future discussions and research partnerships with these selected emerging, global academic leaders. During the two-year award, each grant recipient is invited to present a seminar on his or her work to the DuPont research community. Originally published by Nina Welding at conductorshare.nd.edu on January 17, 2017.